KNOXVILLE, Tenn. — The Southeastern Conference’s eighth-annual observance of “We Back Pat” Week officially gets under way on Sunday, Jan. 20, and runs through Sunday, Jan. 27. For the first time, Tennessee fans will have two opportunities in the same week to show their support for the Pat Summitt Foundation. The first chance comes on Monday, as the Lady Vols play host to Arkansas in a 7 p.m. contest at Thompson-Boling Arena. The SEC Network will have the telecast. UT also will have a second “We Back Pat” branded game on Thursday, Jan 24, as No. 1/1 Notre Dame comes to Rocky Top to face Tennessee in a 7 p.m. contest on ESPN. Fans are encouraged to wear a “We Back Pat” shirt to both games. “We Back Pat” shirts will be available for sale at the Vol Shop. Each shirt contains a special code for a discounted ticket to both UT “We Back Pat” games. Orange and purple shakers, courtesy of the Pat Summitt Foundation, will be available at both games for fans to pick up from the Fan HQ table at Section 129 while supplies last. During Monday’s halftime, fans will have the opportunity to meet the 2019 Tennessee softball team and hear a special tribute performance by the Tennessee Pep Band. On Thursday, fans will want to stay in their seats during halftime for the world famous acrobat, Red Panda. Additional promotions and fun can be found at: https://utsports.com/sports/2017/9/27/fan-experience.aspx. There will be check presentations from various events and organizations to the Pat Summitt Foundation prior to the Arkansas game and one from the Pat Summitt Foundation to the Pat Summitt Clinic at UT Medical Center during the first quarter of the Notre Dame contest. “We Back Pat” Week is celebrated by all 14 teams in the SEC, and many other basketball programs around the world take time to observe the occasion as well. The initiative, which utilizes promotional public address announcements, video endorsements and television exposure to share a very important message, focuses on raising awareness of Alzheimer’s disease and The Pat Summitt Foundation’s role in fighting it. The outpouring of support across the conference and around the country has been incredible. 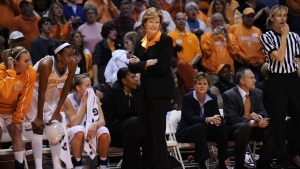 The visibility that the SEC brings with the annual week gives the Foundation and its mission national attention to help eradicate Alzheimer’s, which prematurely ended the career and life of the greatest coach in women’s basketball, Tennessee’s Pat Summitt. 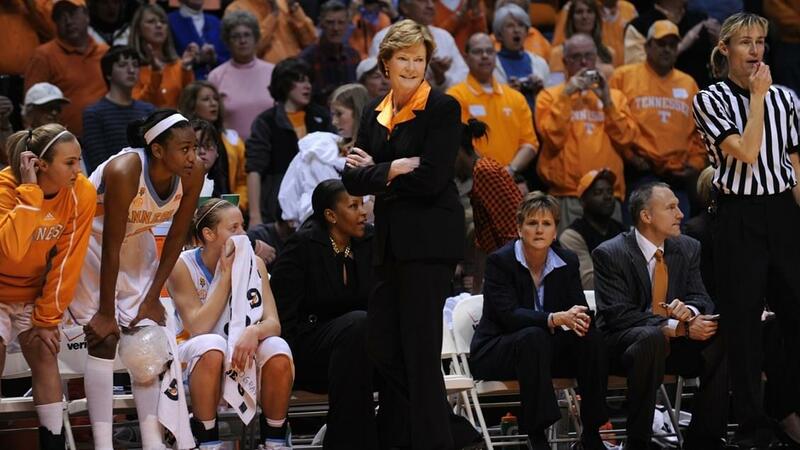 The Pat Summitt Clinic, located at the University of Tennessee Medical Center, is ground zero in the fight against this disease. The clinic is a state-of-the-art facility with a serene environment designed from top to bottom with the unique needs of Alzheimer’s patients as the focal point. The multidisciplinary team approach of the clinic is a unique and major strength of the entity with regard to providing the absolute best care possible for patients and families. The clinic employs neurologists, neuropsychiatrists, nurses, social workers and other health care professionals involved in the care of Alzheimer’s disease patients and caregivers. So, when a patient and caregiver come to the clinic, they will get all their needs met in one place as opposed to having to see all of these various health care professionals at different facilities and at different times. Additionally, this team of heath care practitioners works together collaboratively to design a comprehensive plan for each patient and caregiver. The medical director is Dr. Roberto Fernandez, a neurologist with many years of experience in providing care for patients and families. He is also passionate about clinical research and is building up the research program at the clinic with the goal of discovering treatments and prevention.